Home|Floral Library|Vanda Orchid – Vanda spp. Has a very high respiration rate compared to most other flowers and plants used by florists. Native to Asia and Malaysia. Common relatives include Cymbidium, Oncidium, Paphiopedilum and Cattleya. Flowers flat, 2-4 inches across, lip reduced, in groups of up to 15 flowers on a stem. Stems leafless, 24-32 inches long. Plant is an epiphyte, classed as a monocotyledon, leaves mostly parallel veined. They can be stored at 55F for 5 days with no loss in quality but flower life is reduced by about 1/3 if stored for 10 days. Vanda coerulea has blue flowers, hybrids of V. teres and V. tricolor are white or yellow-orange, variety called ‘Miss Joaquim’ is lavender with a blue center. As an epiphyte, it is a plant in its native habitat that grows upon other plants but is not parasitic. It obtains its moisture from air. Vanda is an Indian name for this genus. One famous vanda is V. coerules (Blue Orchid) that comes from Northern India. 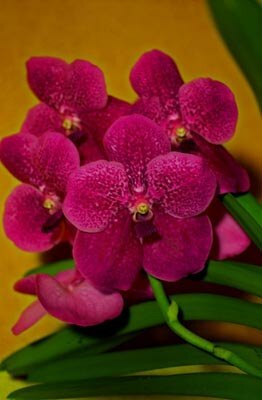 Also, many Vanda orchids have been reclassified into other genera such as V. teres to Papilionanthe teres, a flower used extensively in the floral trade.